A couple weeks back, I contacted AMD to let them know I was working on a notebook review—a Clevo P170EM from AVADirect with HD 7970M graphics. Much to my surprise, when I received the notebook I discovered it used AMD’s Dynamic Switchable Graphics, now rebranded as Enduro. It has been just over a year since my last look at the technology, where things were so bad that I felt most users would be better off if they had only discrete AMD GPUs and no switchable graphics—or they could simply buy NVIDIA Optimus enabled laptops. The short story is that my initial experience with the P170EM was largely the same, only the lack of driver updates was even more damning when looking at a notebook sporting such a high-end GPU. What could be done? AMD scheduled a meeting with me to go over the latest updates, and thankfully things aren’t quite so grim as I first thought. First, let’s get everyone up to speed. Historically speaking, AMD/ATI has been on the forefront of switchable graphics technology. While the first laptop with switchable graphics tested at AnandTech used NVIDIA’s implementation (the ASUS UL80Vt), Radeon-based alternatives also existed in a similar time frame. The main problems with early switchable graphics solutions is that they required extra hardware on the manufacturer side (muxes), increasing cost, and more importantly you were generally locked in to getting graphics driver updates from the laptop OEM. NVIDIA addressed both problems when they launched Optimus in early 2010, and while there were certainly some teething pains the vast majority of users have been pleased with the result. Where did that leave AMD? Simply put: out of most laptops. Was it because NVIDIA had superior technology, better drivers, or better marketing? I’d say yes to all three, and it has been painful to watch as the number of laptops with discrete GPUs (at least in the US) has largely shifted to being NVIDIA products. Up until now, if you wanted a laptop with a discrete GPU, the ability to switch off that GPU, and you wanted regular driver updates, your only viable option has been NVIDIA equipped laptops. Perhaps that’s why every major OEM (along with most smaller OEMs/ODMs) ships at least some of their laptops with NVIDIA’s Optimus Technology. With laptop sales now outpacing desktop sales, giving up so much ground to their competitor is a serious problem AMD needs to overcome. 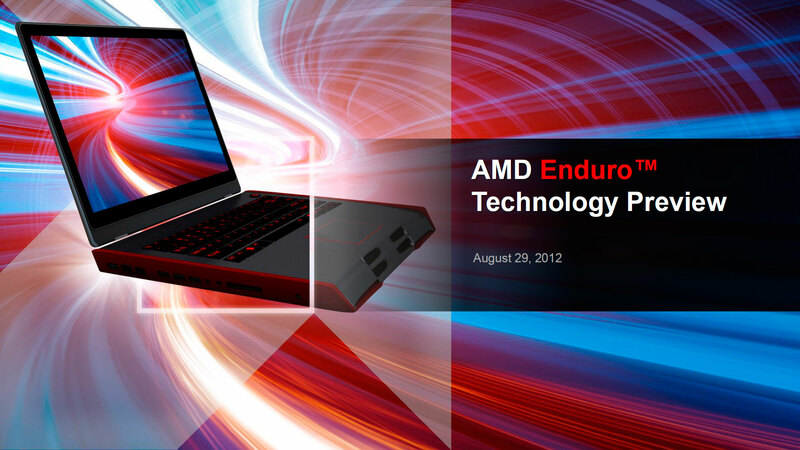 I should note that AMD has other products that actually help get around our concerns with Enduro. The Llano and Trinity APUs for example offer integrated GPU that are as fast (faster in some cases) as discrete GPUs. If you’re looking for a good budget laptop that gets excellent battery life and you don’t want to deal with switchable graphics at all, Llano started the trend of providing a decent GPU with acceptable CPU performance and Trinity continues that trend. Even better: driver updates aren’t a problem as there’s only one AMD GPU to contend with. Trinity/Llano didn’t win any awards for pure performance, but in terms of bang for the buck and creating a well-rounded device, the APUs have proven successful. But we’re not going to worry about Trinity/Llano or other APUs; today’s focus is on discrete GPUs and switching between these high-power, high-performance GPUs and low-power, low-performance integrated graphics. With that out of the way, let’s look at the history of AMD’s switchable graphics as well as where they intend to go in the near future. Unfortunately this is not the case. The Enduro issue has actually driven more sales for Nvidia. AnandTech, please take a look at NBR forums. The number of decisions posted by NBR members saying, they have decided to pay an extra $300 for working Optimus far exceeds decision to buy 7970M equipped Clevo notebooks. This is after the member inquires on what is the best use of their money. On NBR it has been concluded for the most part. Even though on paper the 680M and the 7970M are equal, it makes far more sense to pay an extra $300 because 680M works. 7970M getting less performance on half the games compared to last gen's 580M? ANYONE WHO IS CONSIDERING A CLEVO P150EM and P170EM BETWEEN 680M AND 7970M, BUY THE 680M. I bought an AVA bare bones P150EM With the Radeon 7970m. I wondered about updating the graphics driver the moment I got it, but I called AVA Direct first because I had heard there were problems with the drivers in doing so. "The drivers pre-installed on your computer are drivers made to interact at best performance with the intergraded graphics card on the mother board(HD graphics 4000). DO NO ATTEMPT TO DOWNLOAD AND INSTALL THE UPDATE ON AMD'S WEBSITE. THEY WILL NOT WORK PROPERLY. We try to make this clear to all who purchase the P150EM and 170, but they do not listen and think they've got it figured out. They go ahead and download the updates and the card fails! Everyone who calls us complaining about performance has tried to update the drivers when we warned them not to." Since I have had my computer, I have had the drivers that it came with and with a 3720QM running ar 3.6Ghz. and 8 gigs of RAM at 1600Mhz, I'm getting Metro 2033 at 29.9 fps with 1920x1080 and all setting maxed out minus Anti-alaising. My card has just the stock drivers and it out performs the 680M on a number of major games and was over 50% cheaper than the 680M. There's NO logical argument anyone could make for choosing the 680M over the 7970m, especially driver support issues! If AMD's lame stock drivers already out perform Nvidia's best, then what will happen when the refined drivers are released? And when I say that the stock drivers out perform Nividia's, I mean in terms of frame rate from game to game- which is the ONLY thing that matters in the end. I am one of hundreds that inhabit the NBR forums who have been unfortunate enough to get the P170EM platform with the 7970M. What began as a promising article (mentioning all the difficulties with the initial P170EM the writer reviewed) degenerated into reporting what the AMD guy promised would be implemented "soon". The question remains: What has AMD done for its customers who purchased the current flagship card? In case the writer hasn't noticed there has been a back-and-forth cyber-war of a sort going on with AMD over this for a few months now, with Enduro SEVERELY crippling performance in muxless designs like the P170EM. To say that the 7970M performs worse in WoW, SC2, Dota2 ..etc than a card 2 generations old is an understatement. Clevo/Sager began documenting the issue then were instructed by AMD to delete the threads on all relevant forums and we've been getting stonewalled since then. Clevo/Sager have reverted to "There is no issue" stance and AMD is simply quiet while doing damage control by all the smoke this article aims to spread. Hmm... :\ Jarred, how optimistic are you that AMD is actually going to be able to deliver this time?